Dr. Matt Willis (Phase 2 Project P.I.) – Dr. Willis was the research lead for the initial project on health automation. He was responsible for the day to day management of the project, ethical review, recruitment, and all other work package 1 responsibilities. He was also responsible for collaborating with the project staff in work package 2 and translating the detailed observation data into the machine learning framework. As a result Dr. Willis has a nuanced understanding of the entire project along with the work that is performed in primary care. 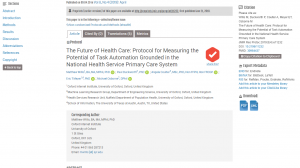 The second phase of the health automation project is to explore additional findings and implications that emerged out of the projects first phase.